Dive bars are an American tradition, where long-lasting memories are created, where people-watching is imperative, and where the greatest stories and a come-as-you-are attitude live. 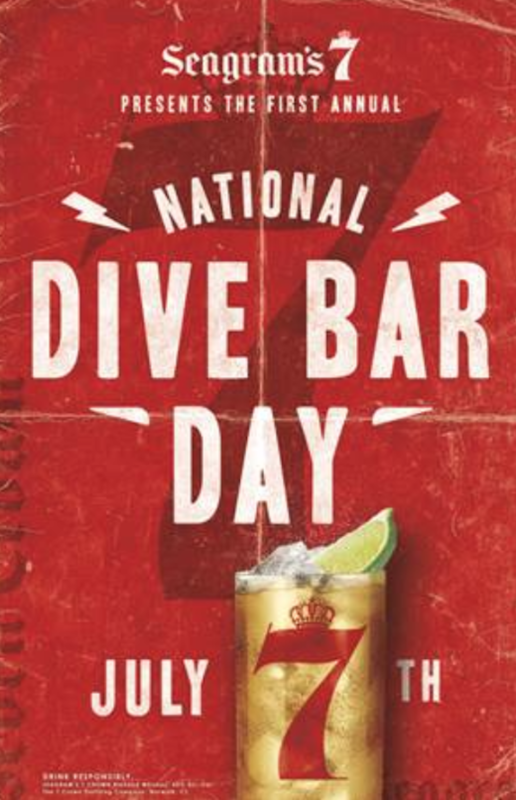 Yesterday Seagram’s 7 Crown announced that they are raising a glass to dive bars everywhere by marking the first official National Dive Bar Day, fittingly taking place on July 7th, 2018 – in celebration of the quintessential Dive Bar drink, the 7&7. To help save Dive Bars everywhere, Seagram’s 7 Crown is also supporting the National Trust for Historic Preservation, a nonprofit organization that protects America’s historic places, that represents our diverse cultural experiences. Seagram’s 7 Crown will donate $25,000 to the organization to support the recognition of historic Dive Bars across the U.S. Directions: Add Seagram’s 7 Crown Blended Whiskey and 7UP to a highball glass with ice. Stir well and garnish with lime slice. Print article This entry was posted by Art Eddy III on July 3, 2018 at 8:17 am, and is filed under Lifestyle. Follow any responses to this post through RSS 2.0. Both comments and pings are currently closed.